A paratha is a type of flat bread that originated in India. 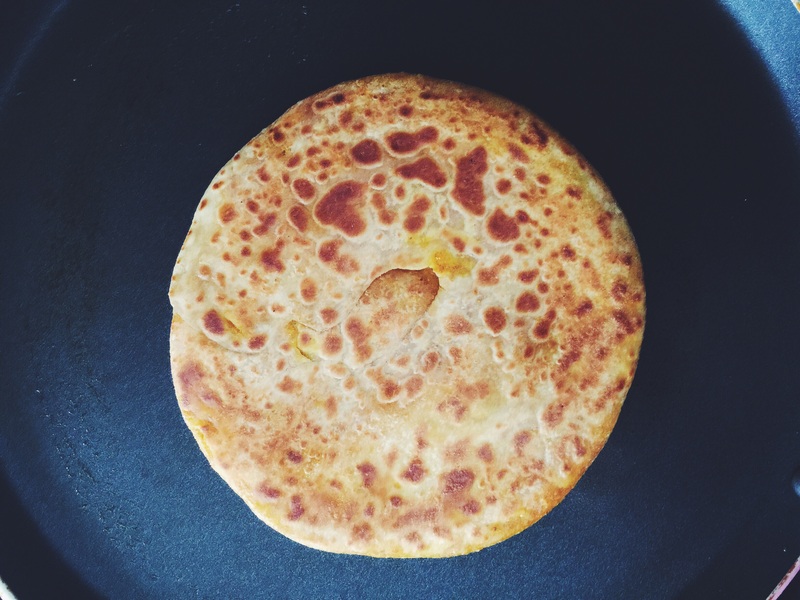 Word Paratha is fusion of two words parat and atta, which literally means layers of cooked dough. Gotta love Wikipedia, smile. The atta/flour can be anything from Whole wheat, millet, Sorghum to Oat. Very versatile and popular being unleavened flat bread fried on the tava with oil, butter or traditionally with ghee. 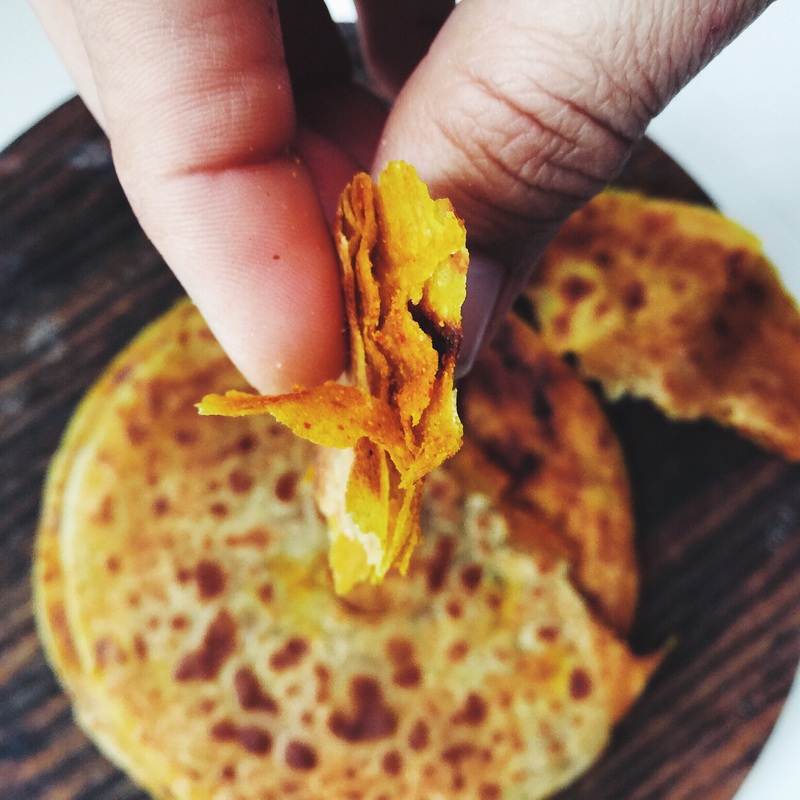 While paratha is most popular in Northern region of India, different region have their own version of it that is native to that part. Paratha can be made in different shapes, square, triangular and circle, the most convenient shape. They can be stuffed with range of different stuffing, paneer & tofu to seasonal vegetables. looks like I can pretty much write a blog alone on parathas. Not a bad idea after all. No matter how daunting it may seem, making Indian flat bread/paratha at home is actually not that hard. Since dough making can be handled by a stand mixer 1/3 of work is done right there for you what is left now is rolling and cooking. I am covering Masala Paratha here and uncovering 2 decade old memories. Do you have a favorite lunchbox memories from your childhood? I have a few, those of my own and those my friends used to bring in their lunchbox. Of course sharing lunch was a norm and food was a way to connect and to appreciate people around you. Food allergy was an unknown world for most of us back then. I recreated this recipe imagining the taste and texture I relished a long time ago from my friends lunchbox. She hails from Royal state of Rajashthan and her mom’s cooking reflected that very well now that when I look back at what I used to have at her place. Spices are at the center stage in Rajashthani cousine as far as my experience is with the food on my recent trip to Jodhpur and Jesalmer. This paratha is the wifi between today and the early school days. Each time I prepare this, I remember my friend and it brings back wonderful childhood memories. Although I have been making and serving this ever since I have my kitchen and that pretty much since I landed in USA. Long time huh…not until recently I realized the recipe is so quick and easy I should share it with rest of you too. Bhavin and I like it fresh and hot off the tava/griddle. Yes we are spoiled with fresh food, first by our wonderful moms and now I am doing the same for my kids, with pleasure and pride. With that said it tastes equally good when cold, if you like to prepare ahead and keep or take along. Pre-prepared soft Chapatti dough, look here for the recipe. 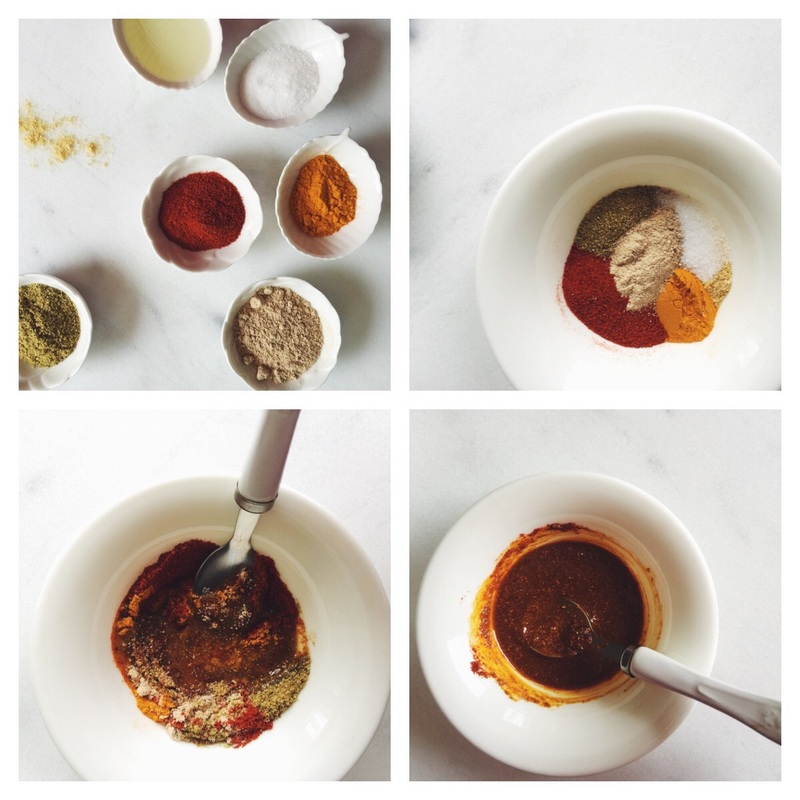 Mix all the ingredients to make masala paste. 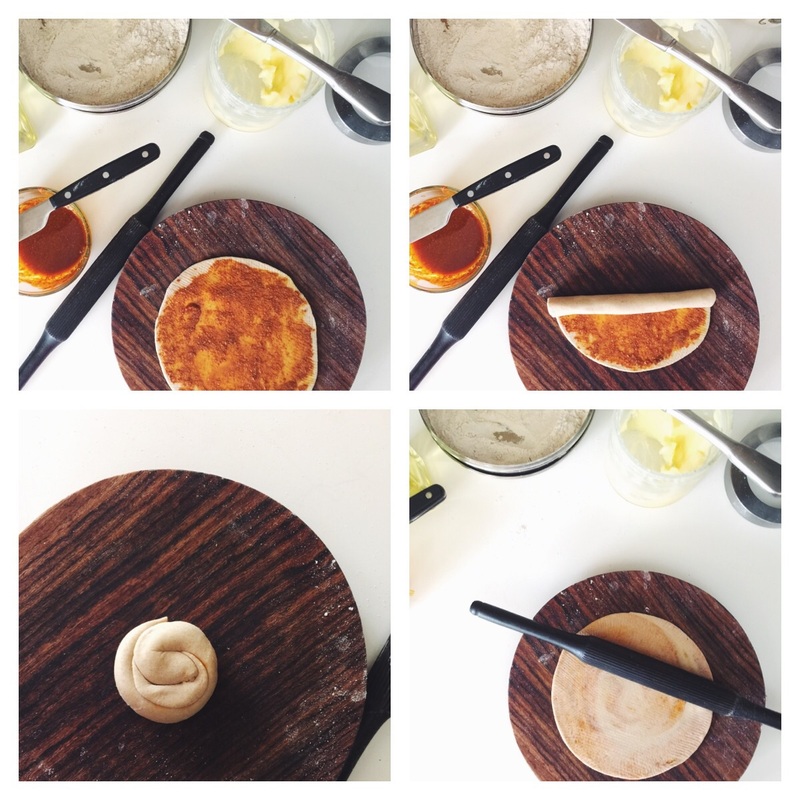 Spread 1 tsp masala paste on rolled paratha and roll that in to a flute as shown and roll again in to a circle, refer the steps in pictures. Now sprinkle some dry flour and roll paratha in to 6″ diameter using rolling-pin. Don’t roll it too thin, preserve the layers as they make paratha/flat bread so flaky. Cook paratha for few minutes on each side and cook with 1 tsp oil or ghee on low-medium flame. Serve warm or cold with Indian Tea or pickle of your choice. For kids I go light on masala, spread about 1/4 tsp for just hint of flavor and my kids like this paratha with cream cheese. Note: This masala paste stays well at room temperature for days. I normally have it ready to use. And like any Indian household I normally have chapati dough in the refrigerator too. Together they make handy breakfast on those busy mornings.